US solar photovoltaic (PV) capacity could increase 5-fold in the next 2-3 years, according to Deutsche Bank Research and RenewEconomy. 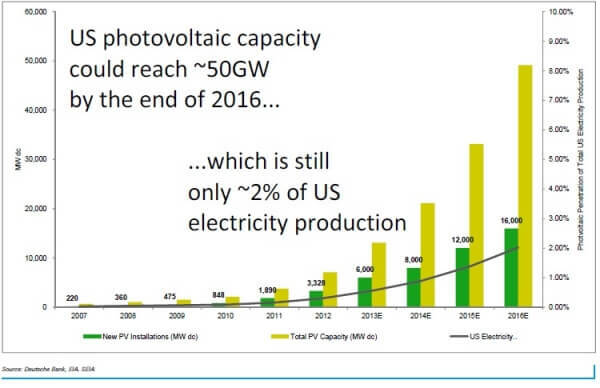 As the US is estimated to already have around 10 gigawatts (GW) of solar PV deployed nation-wide, this would bring the total to 50GW by the end of 2016. Of the additional 40 gigawatts (GW) of solar panels that Deutsche Bank projects will be installed, 30GW will come from ‘distributed’ systems–residential solar PV systems and commercial projects. If the predictions bear themselves out, there are huge implications for the US solar industry and for the future of electricity generation in the country as we know it. To date, solar power projects in the US have leaned heavily towards larger utility-scale plants, with over half of the current installed capacity (about 5.4GW) concentrated in the approximately 1,400 plants with a capacity of over 500 kilowatts (kW). This is tipped to change in in the coming years, however, with the majority of growth expected among smaller-scale, rooftop installations. Growth in residential and commercial solar power means that a huge number of homes and businesses will begin to take energy matters into their own hands. ‘Distributed’ PV systems, as the smaller systems are known, allow those who own or lease them to generate a portion of their own power on-site. To those who have them, distributed systems offer the twofold benefit of reducing the amount of money paid to utilities (through ‘self-consumption’ of solar power), plus credits on their power bills (when excess solar power is ‘exported’ to the grid). In the bigger picture, growth in distributed generation heralds the beginning of a kind of revolution in the way that electricity is generated and transmitted in this country. The dominant distribution model consists of large, centralized power plants delivering electricity across the grid to ‘consumers’ on the other end. In contrast to this, rooftop solar PV systems generate power to be utilized on-site or nearby–power travels a much shorter distance. While not necessarily enabling a grid-connected home or business to be totally energy self-sufficient, having solar panels still increases their degree of independence substantially. When enough ‘behind-the-meter’ solar power is in place, it can even contribute to a reduction in electricity demand as it is ordinarily measured across the whole of the grid. Lower demand means less power needing to be generated from conventional fossil fuel or nuclear plants, as well as potentially lower profits for utilities. This is why solar PV is often referred to as a ‘disruptive technology’; it has enormous potential to upset the status quo. And indeed, a veritable war between utilities and the solar industry is anticipated–or already underway. 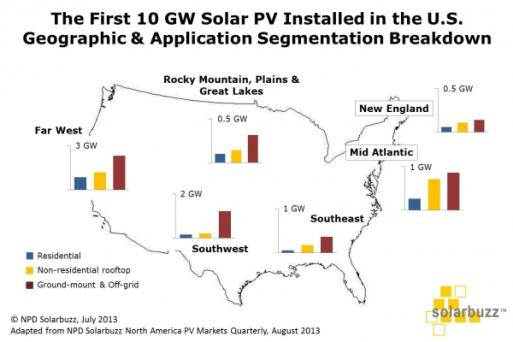 Time for the US to flex its solar muscle? The US–already now in the ‘maturing solar market’ club according to NPD Solarbuzz–is finally beginning to live up to its potential to become a rooftop solar powerhouse. It might come as a surprise to some to learn that the world leader in installed solar PV capacity by far–despite its relatively small size and generally cloudier climate–is Germany, with about 35GW already installed. 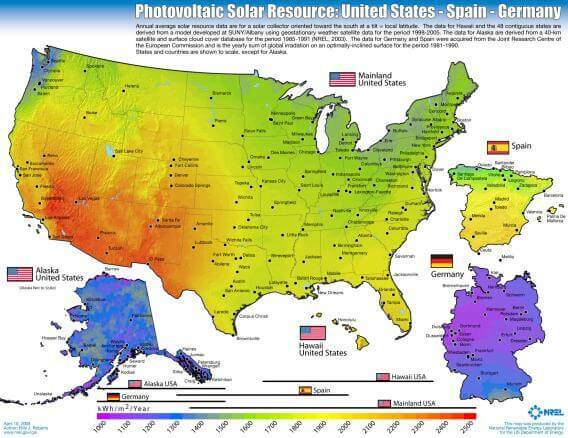 The solar potential of the US (contrary to what some have comically suggested) is vastly superior based on land area alone, not to mention the amount of the country at lower (and sunnier) latitudes than Germany. This tells us that making solar work in the here is more a matter of will than resources. and it looks like solar growth will be sustainable, even as subsidies are withdrawn. There are lots of policies in place on the federal, state, and local levels that are helping solar to make sense for investors and households. Among the most generous and important of these is the federal government’s Income Tax Credit (ITC), which applies to individuals as well as businesses, and effectively works out to a 30% rebate on the cost of installing a system. The reduction of the ITC rebate from 30% to 10% in 2016, combined with expected further decreases in PV system installation prices throughout the country, is likely to spur a rush to install by the end of that year–an incentive-driven ‘solar boom’, the likes of which are well known in other countries with more mature solar markets. The gradual withdrawal of state and local incentives will almost certainly have the same effect here; solar systems will become more affordable, and governments and utilities will drop their incentives for them (as recently happened with LIPA on Long Island). Deutsch Bank notes that solar PV system prices have come down considerably in just the past few years, having already reached unsubsidized ‘grid price parity’ in a number of states. This means that the levelized cost of energy (LCOE–the cost of solar system spread across the units of electricity it produces over its lifetime) from a solar PV system is equivalent to that of grid electricity. Grid price parity, in other words, is the point at which it makes just as much financial sense invest in a solar system as to stick with the grid–and nearly half the US states are either already there or very close. Whether the home or business in question is thinking about a solar system purchase or a zero-down solar leasing deal, lower solar system prices will benefit them. For those thinking about buying a system, there is the obvious advantage of the lower up-front cost. For those thinking about leasing, this means your the company that leases you your system can sell you the solar power for less. In either case, it looks like the age of solar power for the people has at last dawned in the USA.